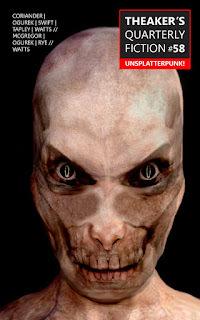 Theaker's Quarterly Fiction: Now out: Theaker's Quarterly Fiction #58: Unsplatterpunk! Well! I laboured through the first story, but found it ghastly, and utterly lacking any uplifting value. Did I miss the point somehow? Then again, I loathed Pulp Fiction, a movie which got at least some critical acclaim. I'll give the rest a miss. Thanks for giving it a try, Chris! Just letting you know, the second story seems to be missing on the ePub edition. The first story was not really to my taste, but I enjoyed the one about the cardinals. Thanks! Thanks, Josh! It was my fault - it was the last story added to the issue, and wasn't part of the main text flow, so it was left out of the export for the ebook version. The epub and mobi versions have now been updated to include that story.